Ferrari, the Italian sports car manufacturer based in Maranello, Italy and Founded by Enzo Ferrari in 1929. From road cars, racing cars and F1, Ferrari has always been at the top. No other car brand instills quality and success like Ferrari and why we at Fast Car Clothes bring you a massive range of Ferrari clothing and accessories that will get your pulse racing! When Enzo Ferrari created his company Scuderia Ferrari in Italy in 1929 his intentions was to sponsor amateur race car drivers and invent racing cars, and it would take more than 15 years before Ferrari began to create their own road cars in 1946. Ferrari is still devoted to the creation of racing cars and high performance sports cars and do not create other types of cars. Scuderia Ferrari is still the widespread name for Gestione Sportiva, the part of the Ferrari company that works with racing. Scuderia is an Italian word and means “stable”, but Scuderia Ferrari is sometime also translated as Team Ferrari. From the beginning, Scuderia Ferrari sponsored race car drivers that were driving Alfa Romeo cars. 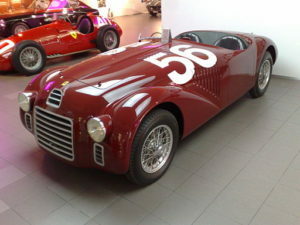 Scuderia Ferrari would prepare Alfa Romeo cars before the race, and in 1938 Enzo Ferrari became officially employed by Alfa Romeo’s racing department. Two years later Enzo Ferrari found out that Alfa Romeo was planning to absorb Scuderia Ferrari, a plan which Enzo Ferrari strongly opposed. He instantly left his job at Alfa Romeo, but his contract restricted him from being involved with racing for several years. He changed Scuderia Ferrari into “Auto Avio Costruzioni Ferrari” and officially manufactured aircraft accessories for a few years. Enzo Ferrari did however create a race car this restricted period. The Tipo 815 debuted at the Mille Miglia race in 1940, but the race was hampered due to World War II and Tipo 815 encountered no real competition. In 1943 Enzo Ferrari moved his factory to Maranello in Italy and one year later the factory was bombed. After the end of World War II, Enzo Ferrari rebuilt his factory and now the Ferrari factory was capable of construction road cars as well. In November 1961 a dispute between Enzo Ferrari and his sales manager, Girolamo Gardini, turned into a crisis. Girolamo Gardini threatened to leave the company. Enzo Ferrari responded to the threat by throwing out Girolamo Gardini, and several employees who agreed with Girolamo Gardini were also ousted. Among them were Romolo Tavoni, manager for Scuderia Ferrari, Giotto Bizzarrini, the chief of the experimental sports car development, and Carlo Chiti, the chief engineer. This was naturally a huge loss for the Ferrari company and the crisis deepened when those who had been thrown out formed their own company – Automobili Turismo e Sport (ATS). ATS even managed to take over Scuderia Serenissima, a very successful racing team, from Ferrari. Until the 1980s when Ferrari began to use fuel injection in the road cars, the Ferraris were known as rather temperamental cars. They could be very unreliable, but would still attract a large group of dedicated fans that viewed this unpredictability as “character” rather than a problem. Today, FIAT controls 56 percent of the Ferrari stocks. The rest of stocks owned by Enzo’s con Piero Ferrari and by Commerzbank, Mediobanca and the Lehman Brothers. Maranello is still the home town for Ferrari. Today the Ferrari range is like no other range of cars. From the awesome 458 to the Mighty 599 they have it all. Each car is built to the highest standard and finish with line up that would get anyone’s pulse racing! Ben Wilson owns and operates Fast Car Clothes.